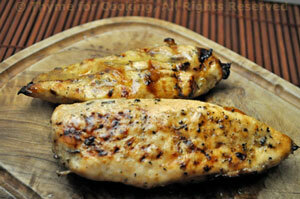 Grilled Lemon Chicken Breasts, from Thyme for Cooking's Weekly Menu Planner. The green and white beans will also be for 2 meals. 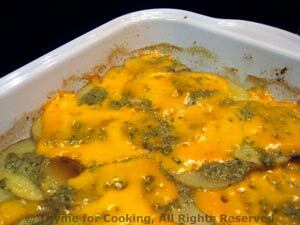 Gently reheat in a warm (350F, 175C) oven for 15 - 20 minutes. In the winter I love to make white beans with sage; this is a summer version, adding green beans and fresh tomatoes. Fresh sage is at its best right now, giving a 'fall' flavor to the dish. This is enough for 2 meals. Tear sage leaves in half. Heat oil in nonstick skillet over medium heat. Add shallots and sauté until tender and transparent, about 7 minutes. Add sage and garlic and sauté another 3 - 4 minutes. 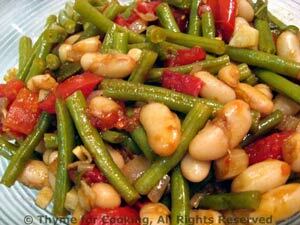 Add both kinds of beans and tomato, cover, reduce heat to low and simmer 20 minutes, until green beans are tender and done. If they start to dry out add a tbs of water or chicken stock. When beans are done, uncover, stir in vinegar and serve.